You probably take yams for granted. You're there, the can of yam is there, there's a yam on the label... open it and mix it up with spices to make a casserole or yam pie or candied yams. Ah, but candied yams or a yam pie made from a home canned yam tastes so much better than the store-bought glop that was processed last year and commercially canned! Here's how to do it, complete instructions in easy steps and completely illustrated. And it is much easier than you think, using my "patented" tips and tricks! Choose medium to large yams that have been cured for at least one week (they're sweeter). Select sound, firm roots. Can them within 1 to 2 months after harvest. For the most food value, choose yams of a deep orange color. Choose small to medium-sized potatoes. They should be mature and not too fibrous. It takes an average of 2- 1/2 pounds of fresh yams per quart. A bushel weighs 50 pounds and yields 17 to 25 quarts. Cook them until they are partially soft (about 15 to 20 minutes in fully boiling water). This is a good time to get your pressure canner filled to 4 inches with water, and start it heating up, with the lid OFF. Later, after you fill the jars with the prepared yams, you must fill the void space (up to the headspace) with a liquid. There are several choices, depending upon how sweet you like them, dietary needs, desire to go "natural, etc. This page shows you all of the options and how to make the solution that's right for you. For most people, a medium syrup of 2 cups of hot water to each cup of sugar is fine. You'll need about 6 cups of water and 3 cups of sugar per 9 pint jars, or 8 cups of hot water and 4 cups of sugar per 7 quart jars. Peel the yams. Then cut medium potatoes, if needed, so that pieces are uniform in size. Caution: Do not mash or puree pieces. The USDA has not been able to get safe results in tests with mashed yams. Fill jars, leaving 1-inch of headspace. 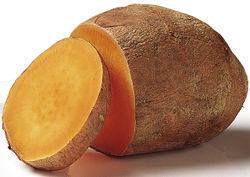 To keep yams from darkening, mix 2 tablespoons orange or lemon juice with each quart of mashed yams. Cover with your choice of fresh boiling water or syrup, leaving 1-inch headspace. It is not recommended to dry pack yams. See this page for more details about headspace! Adjust lids and process, following the next steps. Recommended process time for Yams in a dial-gauge pressure canner. 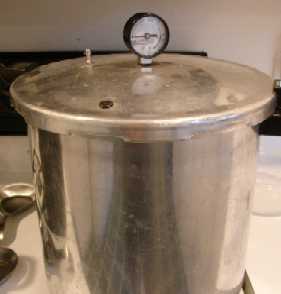 Recommended process time for Yams in a weighted-gauge pressure canner. Preheat oven to 350 degrees F. In large mixer bowl, beat hot yams with margarine until smooth. Add remaining ingredients except pastry shell and Pecan Topping; mix well. Pour into pastry shell. Bake 30 minutes. Remove from oven; spoon Pecan Topping evenly over top. bake 20 to 25 minutes longer or until golden brown. Cool. Serve warm or chilled. Refrigerate leftovers.